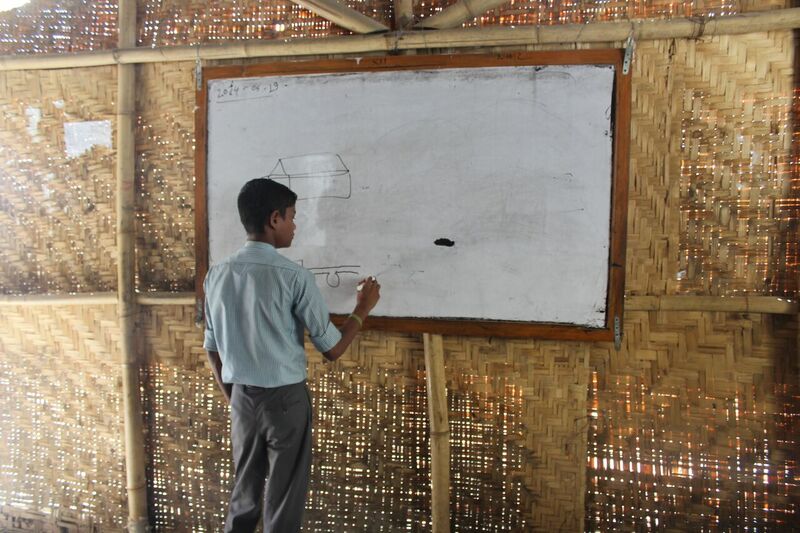 Student of Viswa Niketan Secondary School drawing a diagram of Rainwater Harvesting System. “I learned many things about rainwater harvesting, menstruation, sanitation and disaster risk reduction. Whatever I learned today, I will certainly share with my family and friends”, shared Mukesh Patel of grade 10. A total of 903 students from Viswa Niketan Secondary School (VNSS) studying in grade 1 to 10 were provided awareness raising training on rainwater harvesting, WASH and disaster management on the month of September, 2017 reaching out to 2709 beneficiaries. A joint initiative of GUTHI and IRHA had installed rainwater harvesting system at the school a year before under Emergency Rain project which was helpful for the children to understand the system. The students were eager to know about the exact RWH mechanism that they had been witnessing for long. They curiously put up many interesting questions as well. "What happens if the recharge well overflows?" one curious mind had questioned, to which GUTHI explained the groundwater mechanism. In regard to waste management, the students were taught about the systems of waste management at Kathmandu. They were specifically taught about the ill effects of waste burning. The students of grade 1, 2 and 3 were approached differently. To leave an impact on their little minds, interactive videos were shown to them. While all the other grades knew the steps of handwashing, grade 1 students hadn’t been subjected to handwashing yet. So, they were practically taught the six steps of hand washing. Thus, the training sessions at Viswa Niketan Secondary School were successfully conducted where the students got knowledge beyond their books. We at GUTHI believe that bringing a positive impact on the young minds through such trainings will certainly bring a better future.